Who is the best Hitmon? I wish I could've polished this game a bit more but I had to make the game itself as well as the music so I was somewhat pressed for time. This is one of those games where you'll find yourself rewarded for talking to as many characters as possible so if you want some goodies then you should look around. 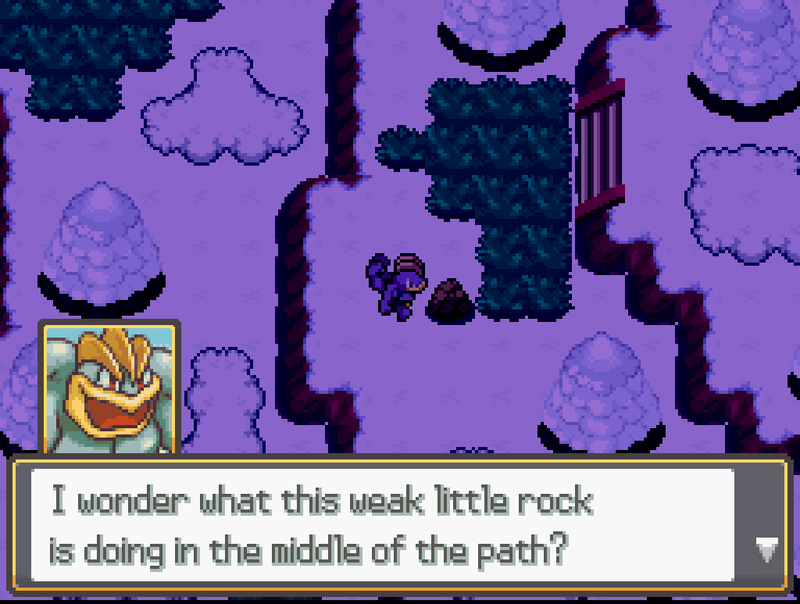 Please talk to the little rock you can see in the screenshot. I'm about 2/3 through the game, (I think) and so far I really love it. It's a quick little game with a good amount of humor in it. I really enjoy these games that are aesthetically pleasing and just look great. Additionally, I really enjoy how the game isn't TOO hard to play through, as I honestly hate playing through fan games with bits that are extremely challenging. Great job, guys! Rhyden, why is the victory theme the John Cena meme song? No, really. I'm not even upset. I genuinely wanna know. I'd always nickname my Machamp JOHN CENA and our original project idea was gonna have a meme song in there so I figured the memes had to live on somehow. Side note, your Squeak Squad remix you posted is pretty sweet, just got around to listening to it. Heh, thanks man! :D I'll admit, beyond the comedic nature of the game, if there's one thing I found impressive, it's the soundtrack. That's a lot of effort to put into a one month-long project. All of the tracks sound pretty good too! Well done, my friend! Yooo this was a fun game, simple as it was. 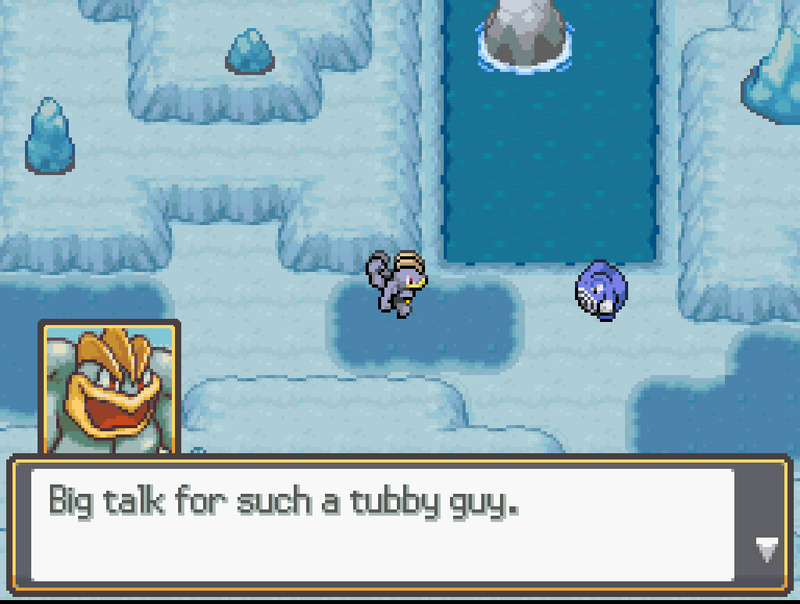 Self-aware, interesting dialogue, cool little secrets, a decent amount of "collectibles" being Machamp's TMs, and overall fun. As far as gameplay goes you might want to change up the game just a bit so the answer to almost every encounter isn't just using your strongest fighting move, but hey, enjoyable experience. You know, I kinda do want to do a sequel without the burden of a time constraint lingering over my head the whole time, but I have bigger and better projects to work on so I can't promise anything. And you're only missing one TM. Here's a list of all of them and where to find them. Sadly I have not had the chance to play it yet nor have I seen the game in its complete form despite having done some small work for it, but from what I have seen thus far, this game is purely amazing. Though I did help out, the kudos goes to the rest of the team. 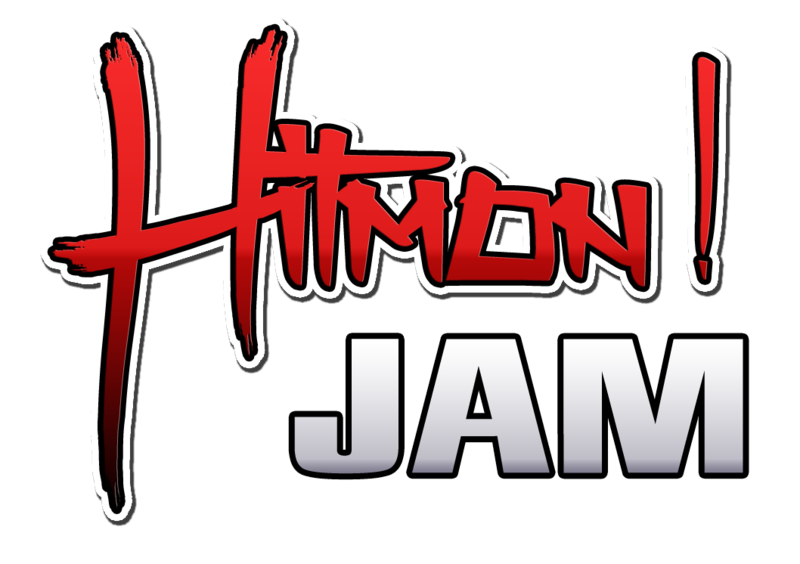 They all put in far more work than I did - especially @Rhyden who did a lot of hard work to make Hitmon Jam! all that it is now. There are some things in the game that just amaze me because they're so perfect and I never would've thought of them. All in all, even though I didn't do much, it was nice to be a part of this project - especially since all of our original ideas fell through early on into the Jam. It was a lot of fun to see what they came up with and I really enjoyed seeing how the game progressed. I hope I don't sound rude when I say this, but it honestly turned out a lot better than I thought it was gonna be. They did some stuff that just blew my mind. You guys did really good - you should all be proud! I LOVED this. Thought it was the perfect game for this sort of Jam. Long, but not too long, challenging, fun puzzles, lots of features, good story, and of course, very funny. There's very little to critique here. The Melee Mountain world is lovely, the characters are all funny and lighthearted, and the story, while simple, is lead by a well written protagonist. I think the use of expression boxes added a TON to the experience of this game. My one critique is really just a personal one: I found myself losing my suspension of disbelief in quite a few areas connected to things that were jarringly out of place. For example, the battle music with the "bing bongs" immediately took me out of the game, even though it was funny for a bit. In addition, while the Terry Crews thing was of course very funny, I think the game would have been stronger as a whole without it. Same goes with the "'MERICA" when you fly. I think the world you've built can stand on its own legs and there's enough jokes about BEEF and being Machoness that smaller, subtler things (i.e. the victory music being the CHAMP) can stand, while these bigger things serve to take me out of the world. A personal pet-peeve of mine: I don't really like overt cameos from YouTubers/people I don't know. As I said before, I think the more subtle, the better. Don't let these critiques fool you, this was a fantastic game and I really enjoyed my time with it! So many times, I found myself musing at how smart the choices made in this game were, i.e. 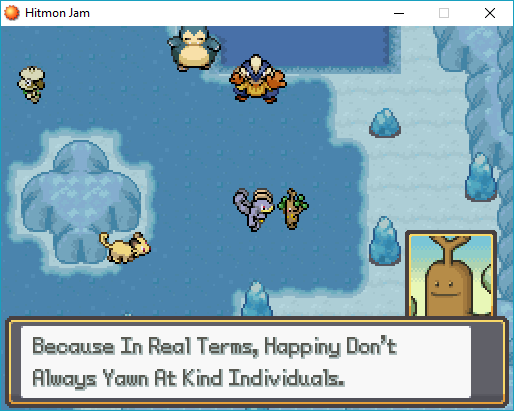 having Lucario heal you, the personalities of the various Pokémon and how well they matched their typing and whatnot, and of course, the fantastic music! 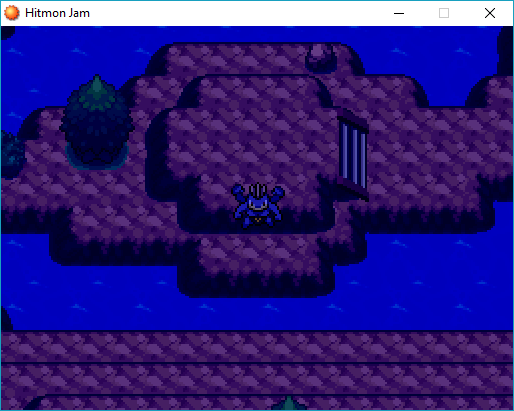 ...I sat at the title screen for at least 2 cycles, don't you dare call me out when that song is jammin like it is. Honestly I don't really have critique for this game because it's super fun and I had a great time playing. So uh, here's some small bugs? I played at night, and all the outdoor maps were dark the whole time. Then at the final boss there's a sunset... I'm honestly not sure if that an intentional joke or an oversight, maybe both. Why isn't this plotline about my dad resolved??? Was he really my dad??? 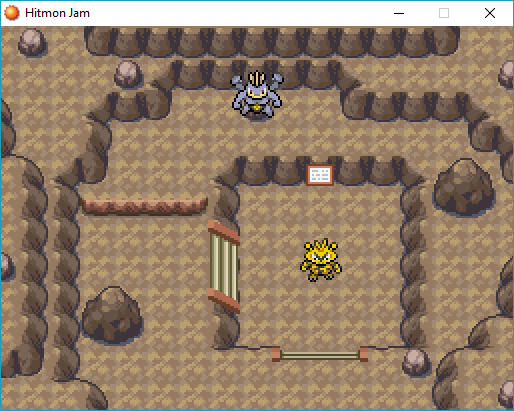 I'm so strong, I can jump up ledges and stand on the small rocks in this room. Or just stand on some cliffs outside. 2) It was totes an oversight but it is kinda funny. 3) You'll have to wait until the Danger Noodle patch to see. 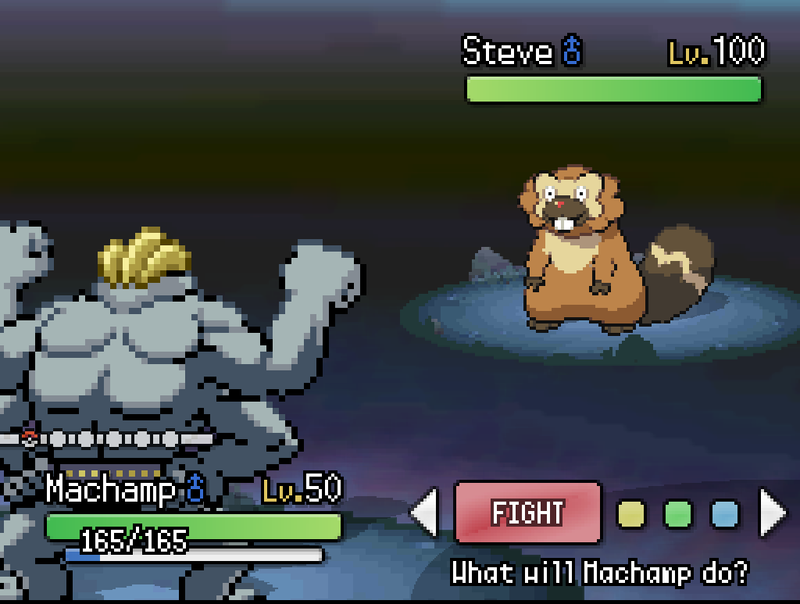 4)Ledge jumping both ways was an accident but it makes sense for Machamp now that I think about it. I don't know what went wrong with the cliffs but I've seen Voltsy (I think?) do that too and I will fix it later. Glad you had fun though, and I should probably upload a version of the title theme where I don't interrupt it every 3.5 minutes. I will try my best to patch any issues the game had when we release our extra content, which will cost a monthly fee of $24 to use (obviously I'm joking about the fee) so thanks for relaying all this information to me. I love it. I still haven't completed it just yet, but I seriously can't wait to. The game was loads of fun and an absolute riot. To me it represents what the game jam is all about -- coming up with cool, unique ideas for games. I do want to echo @Shgeldz's points about the suspension of disbelief in a few areas (something I reflected on a bit afterwards), and one other thing I forgot to mention during the stream: I felt like the random encounters in the grass slowed down traversing the main hub, especially considering they weren't essential to the game and offered very little exp. They felt out of place to me. Other than those things, I think any other critiques are mostly nitpicks. You struck gold with this game and ran with it. I'm looking forward to the update! Edit: Of course, just writing this made me want to go back and beat it haha. Definitely looking forward to the next content patch now! I just played through it and it was amazing. Short, sweet, and hilarious. I really liked the boss scenes and the badge scenes ya'll put in there. I didn't find anything really wrong with it so I don't have much negative to say in the way of criticism other than maybe the boss battles were too easy. Either way, great stuff. Loved it. for a game that was built within such a short time frame, it was a beautiful game to play through. if there ever were DLC made for this in the same way that is being done with Edge Rising, may i make a suggestion?? Master Fushi teleports you to his temple, which can be similar to any martial arts movie brand temple... and he instructs you to face his greatest students with the pagoda, it would be reminiscent of the Bruce Lee movie of the same name, there Machamp can be challenged even further. anyway... this game like i said was a lot of fun, even if i sound like i am complaining for more. Fighting Types, Dragon Types and Psychic Types are my three fave Types, so it was cool to play a game themed on one of those types, a type that is sometimes Underrated by players, which is a shame considering that they are such a diverse community. I'm glad you enjoyed the game! A post-game update is already being worked on and it'll flip most aspects of the game on its head. It should be out sometime before the end of the year since it's not that big of an update, but I can't promise anything. I had fun with this game! 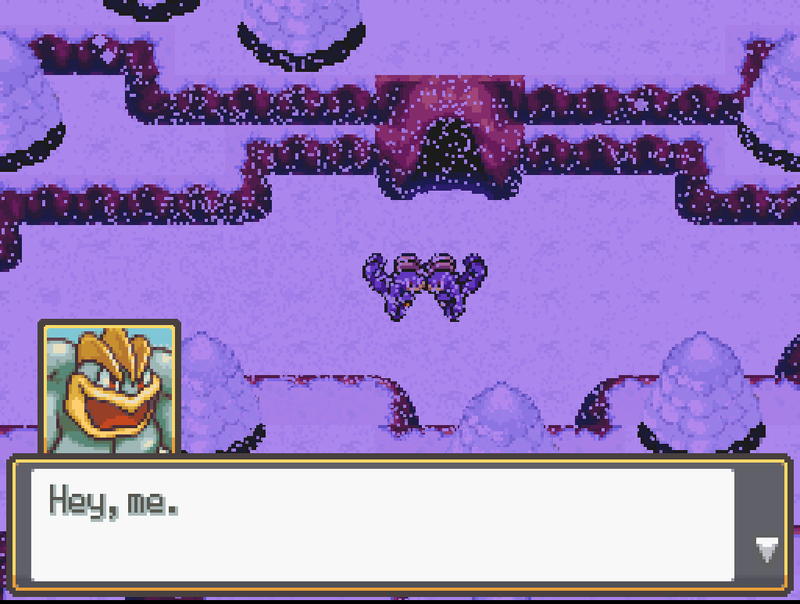 I like just the concept of being able to play as a Machamp, & how it's not just like Mystery Dungeon for example, where you have the moves of the Pokemon you're playing as but can't really utilize the Pokemon's abilities that you read in the Pokedex for example, here you totally can! I thought that was the coolest part, I would have loved to have seen more parts like where you can crush boulders, cuz I was totally expecting to break the mountain in half at the end or something. There were a whole of silly parts as well, however (as its been mentioned), I felt some of the references got distracting. This is a game with a silly premise after all, so I was totally laughing along with the game, but the humor referencing outside things had me feeling lost at times cuz I had no idea what was going on. I think it's okay for random dialogue, but some of it was tied into the path you need to take to get to the end. The game was fairly easy as well, which is perfect for this game! I just would've liked to have see some variety in the fights though, like a ghost type or even more Pokemon fighting you instead of just one every time they meet eyes with you. Otherwise though, I had a fun time. It's a cool idea for a game like I said, I'd totally play more when that comes out! Simply loved your game Rhyden. I had lots of fun playing this. 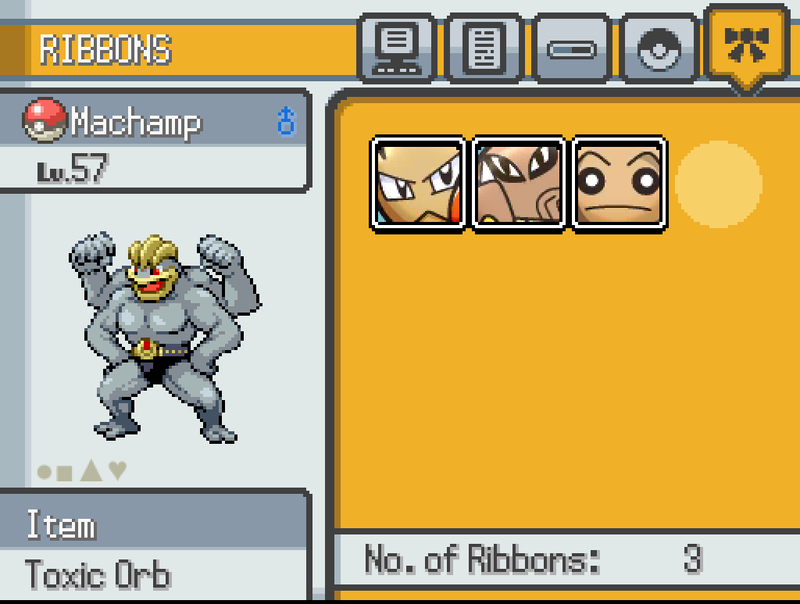 As mentioned in other comments it was a unique experience playing as a machamp and I also liked the references in the game. I really hope you make a sequel for this game. The only flaw which I felt was that the game was too easy to finish. On the whole great game Rhyden and I can't wait to play more of your games in the future. Good luck !!!!! Hey there! I really like the game, I just wanted to mention a glitch I came across. 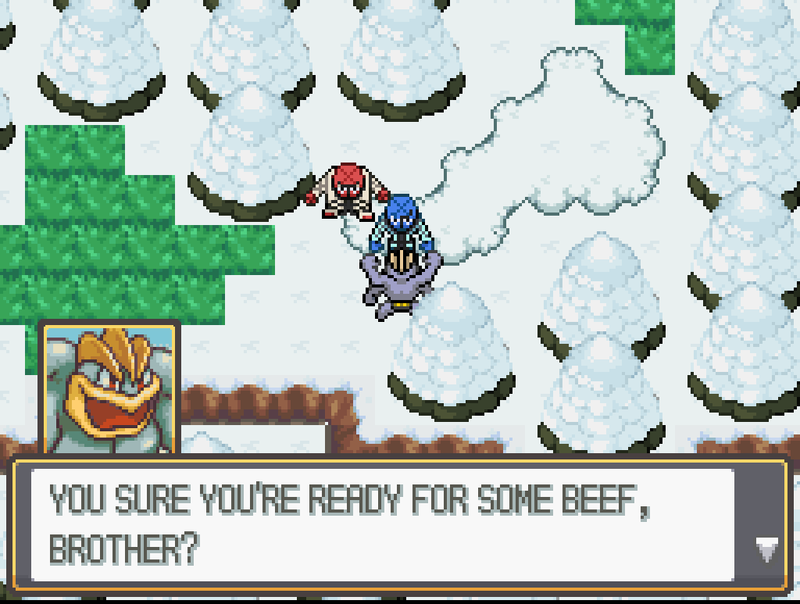 I lost to Hitmonlee, and wound up at the Mountain Base. The game still ran the dialogue as if I had beaten him, and gave me the badge. 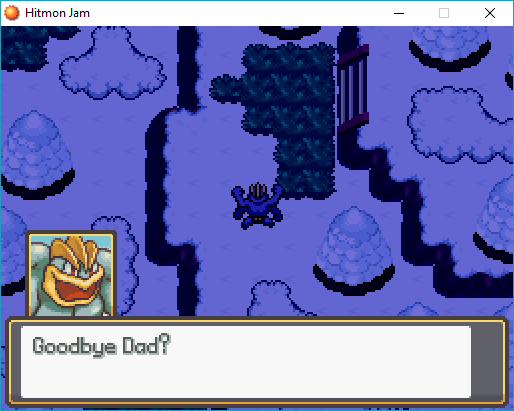 I backtracked through the cave, but couldn't speak to the Pangoro. It wasn't a big deal, as I saved before fighting him, but I thought you would like to know. Otherwise, really great game so far! I love the humor, it's a lot of fun. Also, this game has the best-looking UI in any Pokemon fan game I've ever seen, really great stuff.